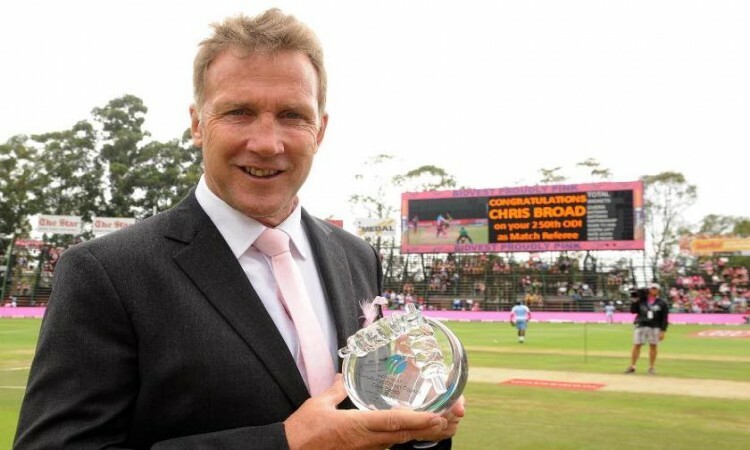 Oct.25 (CRICKETNMORE) - Chris Broad today became only the second member of the Emirates ICC Elite Panel of Match Referees to reach 300 ODIs when he walked out for the toss in the third ODI between India and the Windies in Pune. Even though Broad made his ODI debut as an official in Auckland in 2004, 11 years after Ranjan Madugalle refereed in his opening match in Karachi, the Englishman now trails the Sri Lankan by only 36 ODIs. Jeff Crowe of New Zealand is third on the list with 270 ODIs, while former India fast bowler Javagal Srinath has officiated in 212 ODIs. Roshan Mahanama retired in 2015 after refereeing in 222 ODIs. Broad is presently sitting on 98 Tests and will become the second referee after Madugalle to complete a unique double by reaching the 100-Test mark in the second Test between New Zealand and Bangladesh in Wellington in March 2019. Madugalle also leads Broad 92-89 on a head-to-head in T20Is. A stylish left-handed top-order batsman during his playing days, Broad became an elite match referee in 2004, a year after refereeing in his maiden Test in Hamilton, and has since refereed in all the ICC Cricket World Cups. “I feel honoured and incredibly fortunate to be actively involved with the game for such a long period,” remarked Broad, adding: “300 is not a number for me but a story of all those who have made contributions and sacrifices so that I can live my dreams and achieve my objectives. On top of that list is my immediate family, and followed by colleagues in the ECB and ICC, and all my mates in the match officials’ panel. “I am enjoying my job as if it was my first day in the office. The passion is there to continue to do what I love most, and in the process, help as many people as possible. To mark the occasion, a memento was presented to Broad before the start of the match.